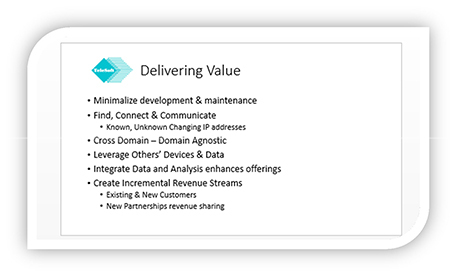 The greatest opportunity exists for those who can leverage any and all connected devices, both their own and installed by others, especially those connected across differing Internet Service Provider Domains, seamlessly collect both raw and preprocessed data, integrate data collected from others with their own and provide an enhanced Analysis, delivering significant new Value to their customer. Equipped with the ability to easily and securely exchange data between authorized devices, especially those installed across multiple or different Domains, we see the opportunity to create new Value to Customers and New Partners in turn generating new Revenue streams. Every Vision has its Business challenges. In this case the need to communicate with installed devices of all types from all sources, whether sensors, edge, fog or applications is paced by the formation of new partnerships creating new processes and business models. The advantages of being one of the initial drivers in expanding and offering Data Sharing and Analysis of integrated data collected across sources and owners can propel you into a market leadership position creating significant revenue streams. 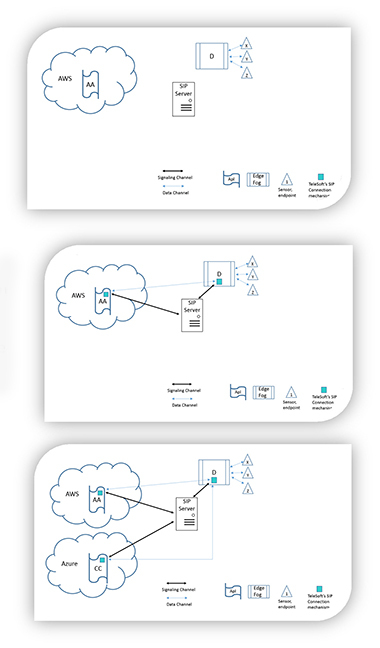 Today’s Domain Specific technology offerings create false “silos” making it challenging for inter device communication, especially cross Domain connectivity where the ability to find, connect and communicate with devices in different Domains requires a development software mechanism for each Domain encountered. Names like Shadow, twin and the like are used to define Domain specificity which creates a constant development and maintenance cycle for each Domain encountered. A simple picture is worth a 1000 words and perhaps displays the 1000 man hours of development required…. 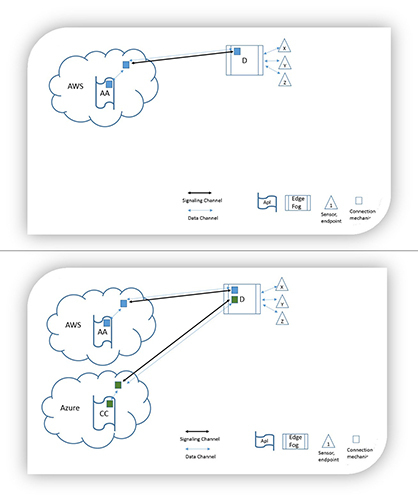 Today’s approach requires unique development for each device (edge, fog, sensor when applicable) installed outside of a single Domain. 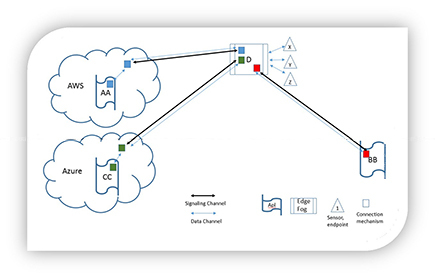 Communicating with a stand-alone cloud connected application creates another identical need to develop and deploy a Connection mechanism establishing similar signaling and data communication. 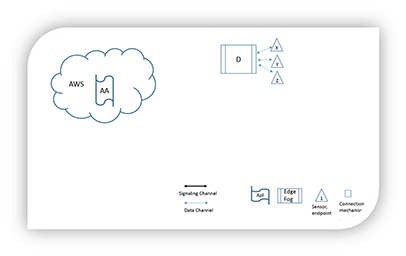 A unique connection mechanism like a shadow / twin is needed for each Cross-Domain connection requiring development and deployment for each new Domain. 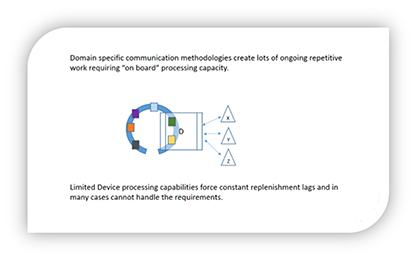 Because many Devices are based on limited capacity platforms (ex: Raspberry Pi) connection mechanisms take up too much processing capability to be useful. 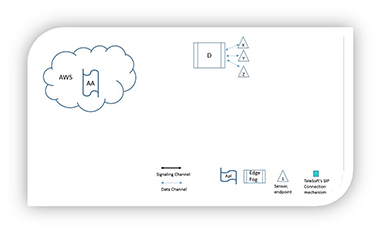 But most Edge/Fog devices are limited or constrained supporting only a limited number of simultaneously “on board” mechanisms forcing constant replenishment cycles. These factors combine to make the scaling of multi cross Domain communication very difficult and often impossible creating impenetrable barriers to achieving potential new revenue streams. The allure of new revenue streams will drive early practitioners to find a proven, established, highly scalable “Universal Communications” mechanism that requires minimal development and ongoing maintenance. As the leading protocol stack development company, TeleSoft has added Data capabilities to SIP, the global standard for VoIP and Video. As a global standard, SIP is proven to have a simplified development effort and is Domain, platform and device agnostic. These traits deliver a simplified and readily available method to achieve cross Domain communication. Access to any one of the many commercially available SIP server is provided, many companies are already using one for their VoIP needs. Leveraging SIP creates both tactical and strategic value. SIP minimizes initial development and ongoing maintenance costs. Most companies are already SIP users with vendors and procedures in place. 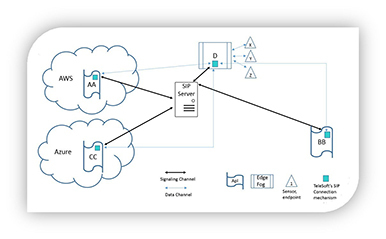 SIP is the Global standard used to Find, Connect and Communicate between two end points, even those with varying IP addresses. It is Domain agnostic eliminating the false barriers imposed by each Domains architecture and methodologies. The ability to collect complementary data from other partners’ devices and the ability to provide your data to your partners creates new best practices, expanded data analysis and offerings creating new revenue streams. Copyright © 1992 - TeleSoft International. All rights reserved.